Discover Granite Countertops Boston by Granite Countertop Pro. Granite Countertop Pro, provides high quality marble and granite for bathroom and kitchen countertops. If you´re considering natural stone kitchen counters, check out our competitive pricing and large selection of natural stones to choose from. 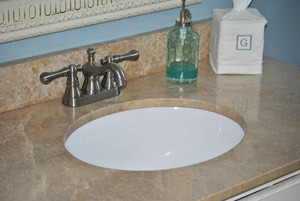 Free Granite Vanity with your countertop purchase! Limited Time only. This is stone and fabrication only. Installation is required and is not included. Must be from current available remnant level 1 inventory. Restrictions may apply. Subject to change without notice.